Please fill out the form below, if you wish, you can write a description at the end. Ratings are on a scale from 1 to 10, 1 being poor and 10 extremely good. If you feel that a rating request does not apply to you, then select nothing. After submitting the review you will receive a confirmation code in your e-mail, this is to reduce unwanted spam submitions. After confirming the e-mail your review will be added on theRestaurantsAruba.com site. We will not share or sell your e-mail address, or send you any spam! Please keep the review neat! Read our Review Guidelines. Are you tempted to write your own review? Don't do it! Click here to learn more about our policy. Are you tempted to write your own review? Don't do it! We reserve the right to edit reviews or remove reviews that do not meet our guidelines. We publish all reviews, good or bad, except for the reasons below. In order to convince us to keep a review online, please do not threaten, challenge us, ie. "I know you won't pubish this review because it is a negative review etc. etc.." This is demeaning to us as well as to you. The integrity of our website demands we print the negative reviews as well as the positive. We will not post reviews which contains e-mail addresses, links and HTML. We will not post reviews that are only a few words long. We will not post submissions that are simply a complaint about a certain incident that occurred during your dining - supposed food poisoning, weather-related issues, etc. We will not post accounts of incidents where legal action may be pending. Submissions that are "letters of complaint" to tour operators, resorts, restaurants, travel agents etc. will not be posted. Reviews that mention employee names in a bad light (it is not fair to complain about an employee by name when they cannot defend themselves). Reviews that are racist, sexist, use obscene language or attack other nationalities. Please refrain from making derogatory comments about other nationalities you meet while on vacation. Your review will be read by thousands of people from all over the world, and these comments can be very offensive! Reviews that attack specific comments of other reviewers. (everyone is entitiled to their own opinion). We have had reports of people telling restaurants they will send a bad review to us if they don't get what they want. Please do not do this! Nobody likes to be threatened in this manner and you will not get the service or changes you want. RestaurantsAruba.com strives to summarize the honest opinions of the people who share their experiences with us. In turn, using this input, our guide is designed to provide travelers with trustworthy information, allowing them to make smart decisions while in Aruba. RestaurantsAruba.com's policy mandates the completely honest and objective gathering and compiling of ratings and reviews. 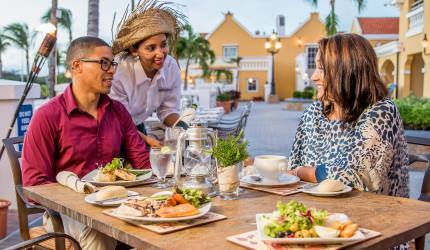 The use of deceptive or unfair practices in an attempt to manipulate these ratings and reviews is a clear violation of this policy and may result in the removal of a restaurant from RestaurantAruba.com's website. Unacceptable practices include, but are not limited to, encouragement of reviewers to submit a review a certain way, offering incentives or rewards for reviewers to submit a review for a restaurant, and reviews by restaurant owners, employees or agents with respect to their own restaurant.